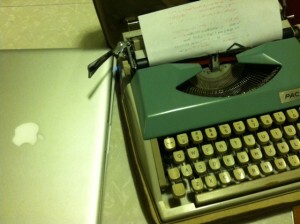 If I took typewriting as a class in high school, it didn’t stick. I remember spending hours in front of my Commodore 64 at home, waiting for the blinking cursor to appear, indicating it was time to start typing what appeared on the screen. It was a fun game, but I lost interest quickly. I guess learning to type is kind of like learning a language–if you don’t use it, you lose it. Since I had little cause to type outside of final papers for English class in high school, I still used the hunt-and-peck method on my mother’s typewriter until I got to college, at which point it was clear that learning how to type would be a necessity. Computers–not Commodores–seemed to appear everywhere I looked on campus, and I refused to be that girl in the computer lab. Everyone seemed to have learned how to type in high school, so I just stopped looking at the keyboard. It took a few months, but I eventually learned how to type. What did other people do? What do people do today? Are skills taught for typing on cell phones? Will there be instruction for iPads and other touch-screen devices? When I started teaching elementary school in 2001, there was a lot of talk about handwriting and how it wasn’t being taught anymore. Indeed, I remember spending hours carefully tracing the cursive alphabet over and over again in the first grade. But we didn’t have enough time in the day to teach something that was clearly becoming obsolete with the surge in digital communication that began with the start of the internet. At the time, the authorization of No Child Left Behind ignited a nationwide panic about test scores, and every extra minute in the day was devoted to test-taking. Neither keyboard skills nor handwriting were taught as part of the curriculum in our school. Now that computers are part of everyday life for so many people, I wonder if keyboard/typing skills are taught, and if so, at what grade level. Are there national standards attached to these skills? lovely post! i too was “taught” to type in middle school (mavis beacon teaches typing!) but had neither the self-discipline nor the need to keep up the skill. wasn’t til we got internet at home a year or so later and i discovered chat rooms, and that hunting and pecking led to getting left left behind in the conversation, that my typing skills picked up. a couple years ago i realized i didn’t need to look at my hands or even the screen any more when i typed. it was a bit of a crazy realization, like i’d become bionic without realizing it. great topic. brings up very interesting “another age” memories. You raise a good point! And one that I think is ever relevant — if you don’t type efficiently, getting left behind is a plausible reality these days. We’ve lived through such an interesting time. And to think I used to wish I lived during the late 1800s or any other time of extreme transition. That would have been pretty cool, too, but now I can’t stop thinking about history as we make it. I just placed ASDF ;LKJ | Mediated into Google and I found your site. I submitted https://opencuny.org/mediated/2012/01/26/asdf-lkj/ over at reddit.com as I figured they will probably enjoy that kind of thing over there.